TORONTO, April 15, 2019 (GLOBE NEWSWIRE) -- Hudbay Minerals Inc. (“Hudbay” or the “company”) (TSX, NYSE: HBM) announced today that it is hosting a site visit by analysts and investors to its Lalor mine in Manitoba on April 15-16, 2019. A copy of the site visit presentation, which contains operational, exploration and other updates, is available on Hudbay’s website at www.hudbay.com. Hudbay also today released its first quarter 2019 Manitoba production results and provided an update on exploration drilling results at its Snow Lake properties. 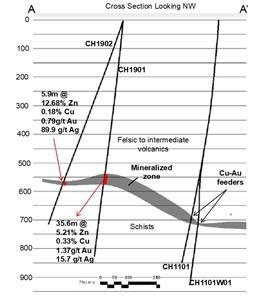 The mineralization was first discovered in drill hole CH1901 completed in February 2019 and is interpreted as a volcanogenic massive sulphide (“VMS”) deposit fed by a system of discrete copper-gold rich feeder zones intersected from drilling completed in 2011 and 2012 by Hudbay (please refer to Figure 2). 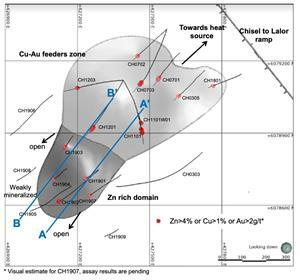 Hudbay has now completed ten drill holes in the area with five holes intersecting significant thicknesses of high-grade zinc with locally high-grade gold and silver content. The mineralization occurs along the hanging wall contact of the stratigraphic horizon hosting the Chisel North deposit (please refer to Figure 3 and Figure 4). 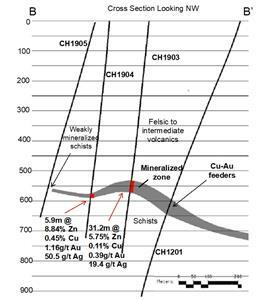 The Chisel North deposit was mined from 2000 to 2012 and produced a total of 3.3 million tonnes at 9.0% zinc. During the first quarter of 2019, Hudbay reported mineral resource estimates for other 100%-owned deposits in the Snow Lake area, including the WIM, PEN II and New Britannia mine properties. For additional information, please refer to the National Instrument (“NI”) 43-101 technical report filed by Hudbay on SEDAR on March 28, 2019. 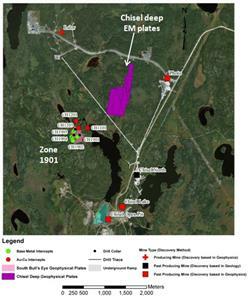 Drilling activities for metallurgical testing, geotechnical investigations and engineering studies are underway at all three of these Snow Lake deposits with the expectation to upgrade the mineral resources estimates to mineral reserves with the 2019 annual year-end reserve and resource update. Hudbay plans to issue a news release containing the first quarter 2019 results on Monday, May 6, 2019. Senior management will host a conference call on Tuesday, May 7, 2019 at 8:00 a.m. ET to discuss the company’s first quarter 2019 results. An archived audio webcast of the call also will be available on Hudbay’s website. The technical and scientific information contained in this news release has been approved by Olivier Tavchandjian, P. Geo, Hudbay’s Vice President, Exploration and Geology. Mr. Tavchandjian is a qualified person pursuant to NI 43-101. This news release contains forward-looking information within the meaning of applicable Canadian and United States securities legislation. All information contained in this news release, other than statements of current and historical fact, is forward-looking information. Often, but not always, forward-looking information can be identified by the use of words such as “plans”, “expects”, “budget”, “guidance”, “scheduled”, “estimates”, “forecasts”, “strategy”, “target”, “intends”, “objective”, “goal”, “understands”, “anticipates” and “believes” (and variations of these or similar words) and statements that certain actions, events or results “may”, “could”, “would”, “should”, “might” “occur” or “be achieved” or “will be taken” (and variations of these or similar expressions). All of the forward-looking information in this news release is qualified by this cautionary note. Forward-looking information includes, but is not limited to, production, cost and capital and exploration expenditure guidance, anticipated production at the company’s Manitoba mines and processing facilities, expectations regarding the Snow Lake gold strategy, including the refurbishment of the New Britannia mill, the low costs of the operation and the possibility of optimizing the value of the company's gold resources at Lalor and elsewhere in Manitoba, the possibility of converting inferred mineral resource estimates to higher confidence categories and discovering additional mineralized zones at Lalor, the potential and the company’s anticipated plans for advancing its mining properties in the Snow Lake region anticipated mine plans, anticipated metals prices and the anticipated sensitivity of the company’s financial performance to metals prices, events that may affect its operations and development projects, anticipated cash flows from operations and related liquidity requirements, the anticipated effect of external factors on revenue, such as commodity prices, estimation of mineral reserves and resources, mine life projections, reclamation costs, economic outlook, government regulation of mining operations, and business and acquisition strategies. Forward-looking information is not, and cannot be, a guarantee of future results or events. Forward-looking information is based on, among other things, opinions, assumptions, estimates and analyses that, while considered reasonable by the company at the date the forward-looking information is provided, inherently are subject to significant risks, uncertainties, contingencies and other factors that may cause actual results and events to be materially different from those expressed or implied by the forward-looking information. The risks, uncertainties, contingencies and other factors that may cause actual results to differ materially from those expressed or implied by the forward-looking information may include, but are not limited to, risks generally associated with the mining industry, such as economic factors (including future commodity prices, currency fluctuations, energy prices and general cost escalation), uncertainties related to the development and operation of the company’s projects (including risks related legal challenges, risks related to the new Lalor mine plan and the schedule for the refurbishment of the New Britannia mill and the ability to convert inferred mineral resource estimates to higher confidence categories), risks related to the maturing nature of the 777 mine and its impact on the related Flin Flon metallurgical complex, dependence on key personnel and employee and union relations, risks in respect of aboriginal and community relations, rights and title claims, operational risks and hazards, including unanticipated environmental, industrial and geological events and developments and the inability to insure against all risks, failure of plant, equipment, processes, transportation and other infrastructure to operate as anticipated, compliance with government and environmental regulations, including permitting requirements and anti-bribery legislation, depletion of the company’s reserves, volatile financial markets that may affect the company’s ability to obtain additional financing on acceptable terms, the failure to obtain required approvals or clearances from government authorities on a timely basis, uncertainties related to the geology, continuity, grade and estimates of mineral reserves and resources, and the potential for variations in grade and recovery rates, uncertain costs of reclamation activities, the company’s ability to comply with its pension and other post-retirement obligations, the company’s ability to abide by the covenants in its debt instruments and other material contracts, tax refunds, hedging transactions, as well as the risks discussed under the heading “Risk Factors” in Hudbay’s most recent Annual Information Form.